Happy Monday everyone! So excited to finish off our last week of school! We spent the whole weekend outside and in the pool so needless to say – we are ready! 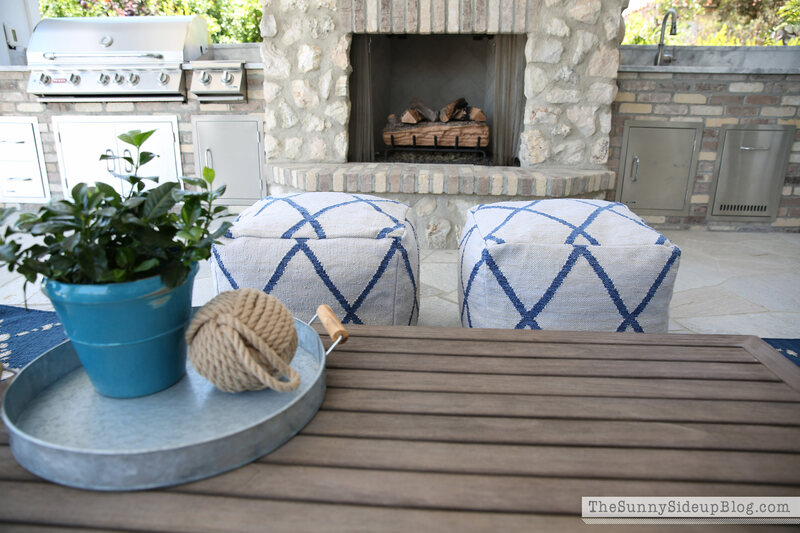 While we were playing in the yard I took some pictures of our outdoor entertaining area to share with you today. 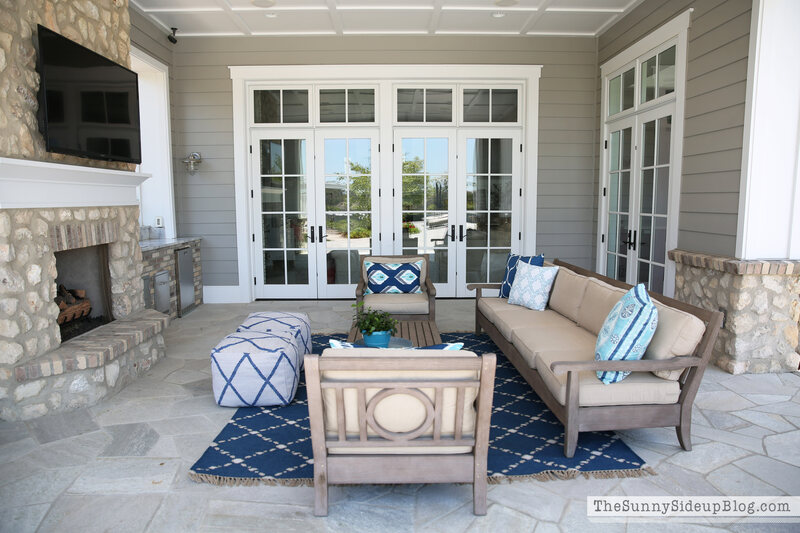 The french doors in our family room lead to this outdoor covered area. It’s a cozy spot to visit with friends, watch a football game in the fall and to BBQ a few hamburgers in the summer time. When we were building I found this gorgeous remnant piece of granite that looked a lot like marble so I used it for the countertop. We bought the furniture for this space last summer and then added the rug and pillows this summer. It has been so fun having this space furnished! We are out here all the time now. The furniture is from the Leagrave set at Restoration Hardware. I’ve loved it for years! Mostly because of the fun design on the back of the furniture. We see this couch out of our french doors in the nook and I love waking up to that fun circle pattern every morning. As much as I love my furniture, we needed some color in our yard! I always knew I wanted to add navy and when Pottery Barn came out with their new outdoor line this year I fell head over heels in love with this rug and these pillows! The rug is their dot n’ dash outdoor rug. (It’s on sale right now btw! So are the pillows!) I bought the 8×10 and even though we could have used a bigger rug in this space, I like that it brings things close creating a cozy seating area in front of the fireplace. These poufs (also from Restoration Hardware) add a fun touch and more seat options. This pillow is my favorite! Pottery Barn’s Katrea pillow. Other pillows I used were Pottery Barn’s Drayton, Izmit, and Malibu Medallion. It’s amazing the difference a few throw pillows make, isn’t it!? They made the yard come alive. 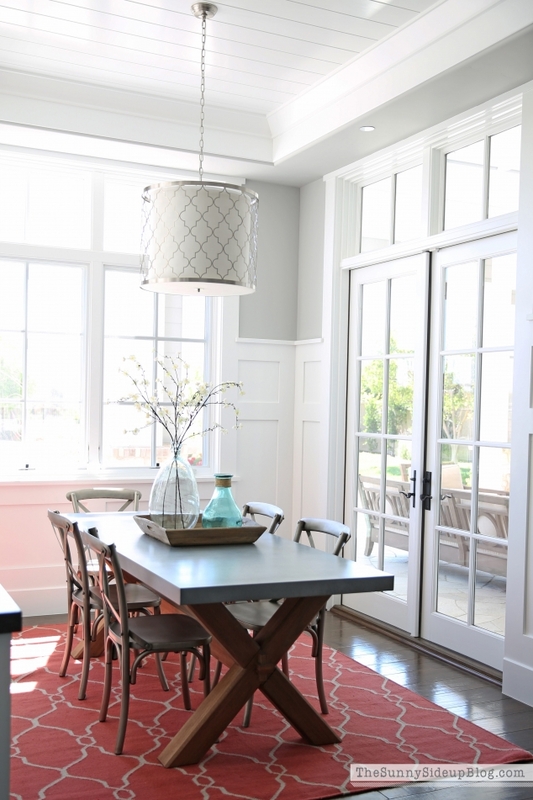 I really wanted a light fixture for this space but when we were building we couldn’t figure out where to center it! If I centered the light over the coffee table, it wouldn’t be centered on the ceiling and if I centered it on the ceiling pattern, it wouldn’t be centered over the table. One of those things we didn’t think about until after the ceiling was in! Oops. There are lots of “hindsight is 20/20” moments when you build. :) There are plenty of can lights so we didn’t really need one. I just thought it would look good! The only downside with having our outdoor space finally furnished is that now I have lost all motivation to get anything done inside the house. Ha! I had quite a list of to-do’s this weekend and they were completely ignored because I was parked on either that couch or the lounge chairs by the pool hanging out with friends and family. Oh well. The to-do list can wait. That’s what summer is all about right? Bring it on. We’re ready. Every time you share a space, I think how I just want to move in! I love you outdoor space. It’s beautiful, just like your yard. You have such a good eye for design and decorating. Oh man, I would spend as much time as I could outside lounging around the pool or sitting on that darling couch. I’m so happy for you. Have a wonderful summer with your cute family! Your outdoor space is amazing. I’ve never seen anything like this before living in Minnesota! I love it. Soooooo jealous! Everything is so gorgeous. I would die and go to heaven if I had an outdoor fireplace like that… someday! What a fabulous space, Erin! It’s no wonder you don’t want to be inside! You have such a fabulous eye for design and decor. It looks comfy cozy and inviting. I’m thrilled for you and your family and friends that you get to enjoy this space. Thanks for sharing! Oh Erin! I was thrilled to see new photos this morning of your new outdoor kitchen space!! I just LOVE it! 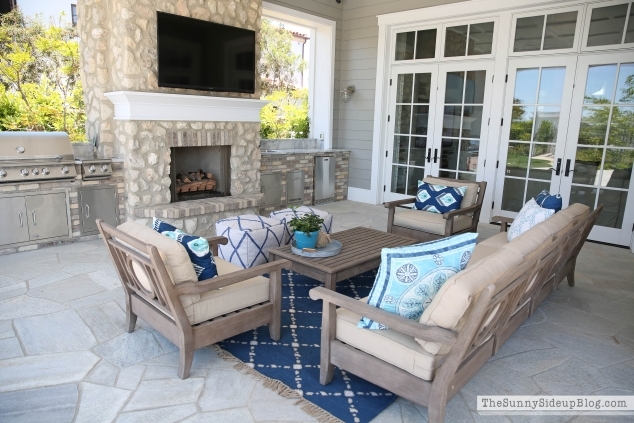 You have taken a beautiful area and made it even more beautiful and cozy with the beautiful mix of blues and turquoises with your outdoor rug and pillows! The furniture is absolutely incredible, and I love the circle design on the backs. 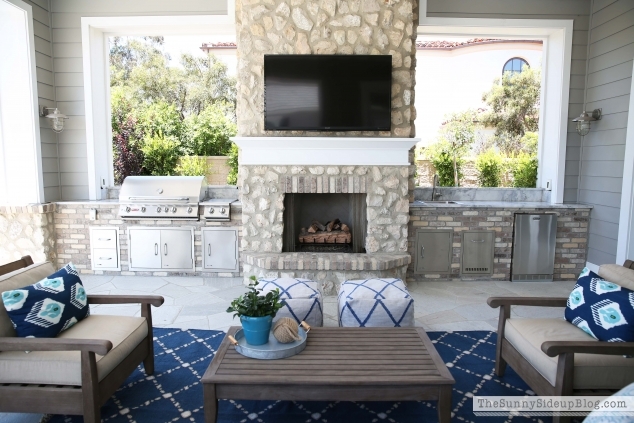 Your San Diego climate is perfect for an outdoor space such as this! You will have such a great summer enjoying your wonderful family and friends in your backyard!! I’m totally in love with not only your backyard but your entire home. Your use of colors, fabrics and accessories is beautiful. I stumbled upon your blog from another blog I follow and I’m so glad I did …. yours is definitely a favorite! Thanks for sharing your beautiful home and family with your readers. Now, can you answer the million dollar question for me ….. what is in the stainless doors under your grill and outdoor sink lol. 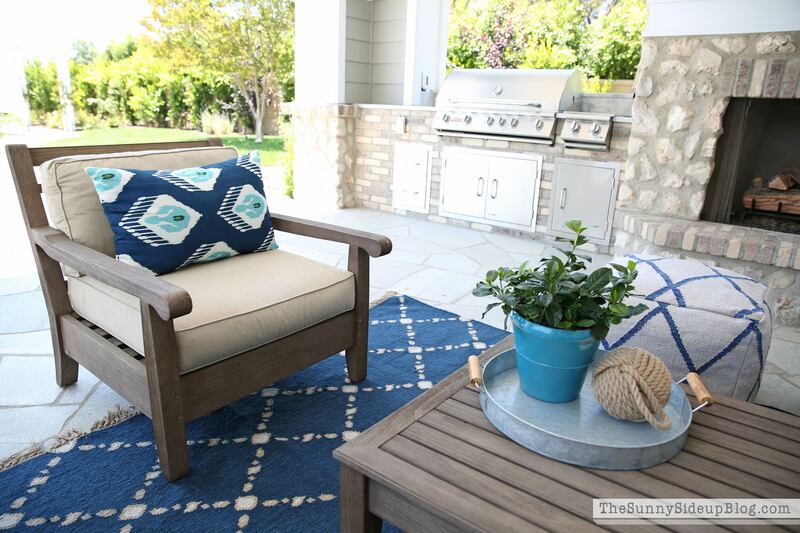 We have recently added a cover to our seating area outside and want to install a grill and I am just beginning to research so this is of the utmost importance to me lolol. Thanks so much and enjoy the last few school days before the dog days of summer. It’s just perfect out there! I really love the navy. I have been loving navy everything lately. It looks really good! I don’t blame you I wouldn’t be doing a darn thing. I’d be sitting by the pool or outside everyday! I’m pretty sure I could bring my son Matt too in his wheelchair; it looks pretty wheelchair friendly, lol! Enjoy your summer! Oh, my…. It’s all so beautiful!!! I just discovered your blog. I love both your inside and outside space. We’re just starting the remodeling process. I have two questions. In your pool, what is the underwater ledge next to the hot tub? 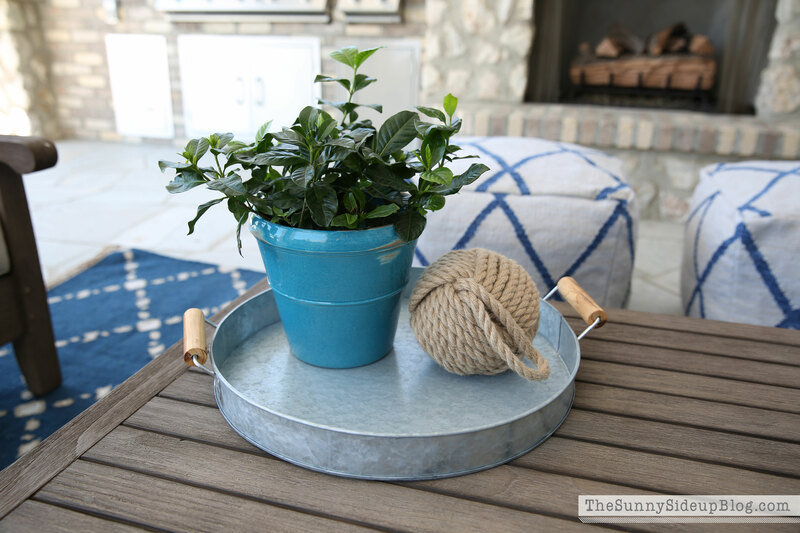 Also, on your patio, if you had to put a hanging light in now, knowing what you know, where would it go? Hi Rebecca! Thank you! The underwater ledge is called a “shamu shelf.” It’s a place for kids to sit/play on. If I could go back I would center our outdoor light over the coffee table/fireplace area! The square panels just didn’t line up right so we bagged it. :) Good luck with your remodel! What’s the name of that granite remnant you used that looks like marble? 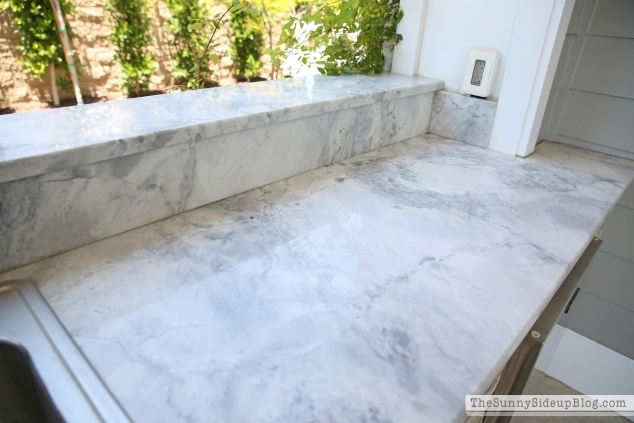 We really like the Italian marble but some say it’s not recommended for the kitchen! Love the white/ gray colors. Thank you! I wish I could tell you the name! It’s the only counter in my house I don’t have a name for. We just picked out a remnant piece that was leftover and had it installed. Sorry I’m not more help! hi, love your blog. where did you purchase this light? Wow — it’s so pretty — I’d definitely be out there all the time too! Enjoy! Wow, every time you share a new area of your home, I think it couldn’t be any more beautiful, but I would be wrong! 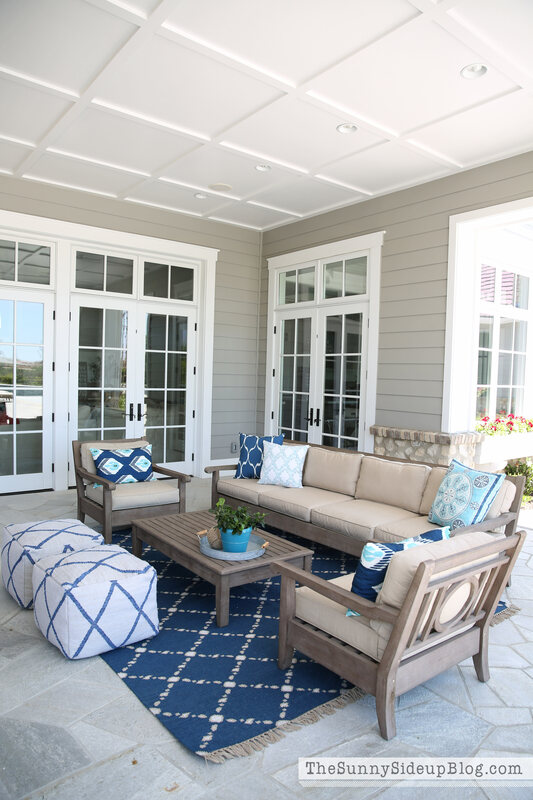 Everything about your home, both inside and out, is absolutely gorgeous! Enjoy your summer. Love the space. Great job! We recently moved to Georgia and are hoping to build a house. I hope to incorporate many of your fabulous ideas! I love this space. 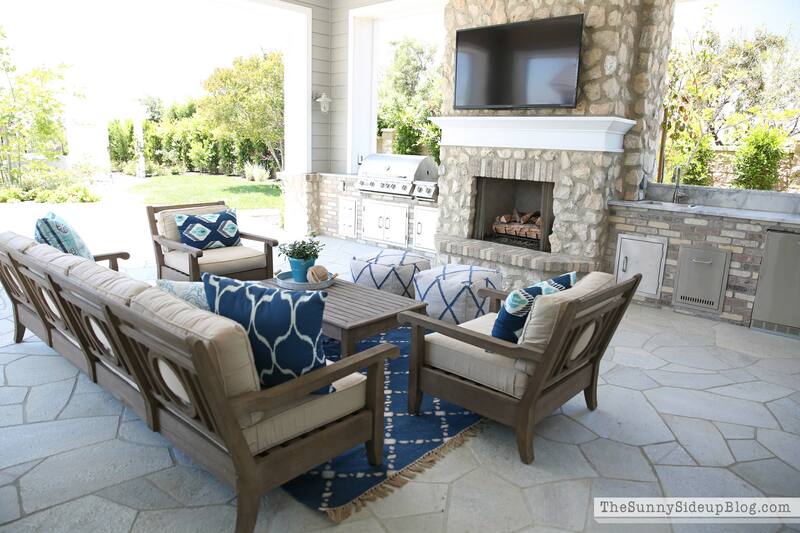 Outdoor spaces are always so difficult when trying to make them feel “homey” and comfortable. That being said, this is a wonderful way to bring the comfort of inside the home into the great outdoors! Who knew you didn’t have to keep home décor in the confines of four walls! I love the color selections, too! I love your outdoor space. I just ordered RH furniture from the Leagrave collection. It was hard to visualize what the wood will look like from their wood samples. I chose the Drifted finish and am sooo hoping this is what you have because it is just what I am looking for. Can you tell me if you have the weathered or drifted finish please. Nice job on it all!! I absolutely love your style! We are currently building a custom home and have a similar outdoor set up! Can you tell me the size of the coffee table? Also, did you go with the classic or luxe? Thanks so much! Erin…my wife and I stumbled across your blog while exploring colors for new exterior paint. Great place by the way..and in San Diego no less…jealous. Our home is in Central California, but our aesthetic is very similar with a hybrid coastal/craftsman style…siding, box beam ceiling work, the “summer living” vibe around our pool area and outdoor living space, etc…you seem to know the routine well. Anyway, my question for you is this: What paint colors did you settle on for the exterior? It looks great in photos. We’ve been kicking tires on some of the SW “greige” varieties…but we’re curious if you can share what you ended up using (or perhaps I missed it in the blog). Thanks! I am new to your blog and really enjoying it! 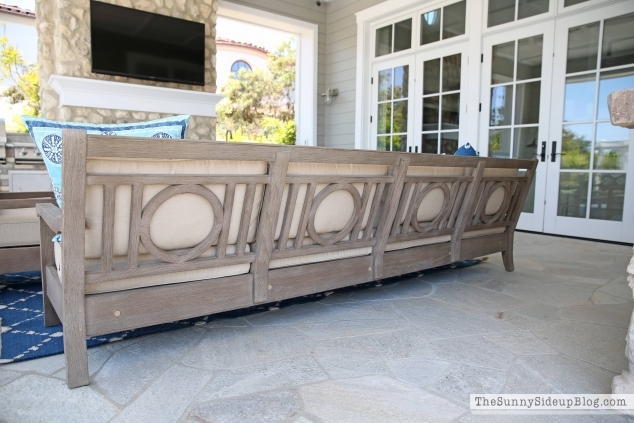 I’m in the process of deciding on patio furniture, and am wondering what size outdoor table you went with? I want 6 side chairs and 2 end, but not sure if the 84″ french beam is large enough. Hi There, I love this space! 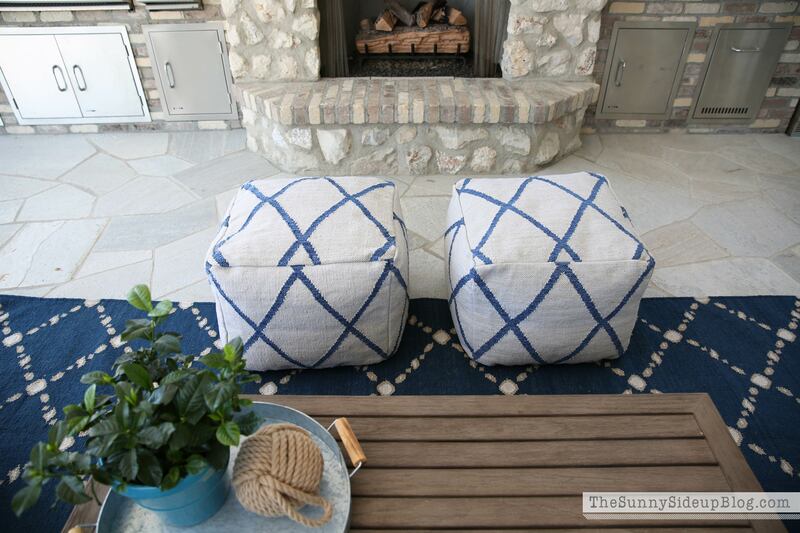 Do you know what fabric and color the cushions are? Thank you! Hi! SOOO lovely your backyard!! Love the colours, the furniture and the rug! Today is raining, this pictures makes me feel happy! Kiss!